Bajaj V pays homage to all the Shaheed Indians, by observing Martyr’s day today, the 23rd of March 2018 at 8pm, and urges us to be a part of this wonderful thought. Bajaj has also posted a short Youtube video, telling us the same. Do have a look. In this video, Jitendra, a security guard living in Surat, had taken the initiative of consistently writing postcards to all the families who lost their beloved for the country. Till date, he has written to about 4000 families. That’s a whole lot of commitment, isn’t it? The latest model Bajaj V15 2018 was announced back in January itself. The most inspiring thing about this bike is the parts with which it has been built with. Bajaj says, that it has used the scrap metal of INS Vikrant, yes the same legendary aircraft carrier of the Indian Navy. Indian Navy apparently had taken the decision to decommission this carrier, and guess what Bajaj Auto took the same scrap metal and used it in the Bajaj V bike. Think the bike is invincible? I hope so because that’s how Bajaj is marketing it. Bajaj V15 2018 comes in the 150cc segment, delivering 12PS at 7500 rpm, the bike achieves a top speed of 109 kmph and has a mileage of 57 kmpl. It comes with features like front disc brakes, alloy wheels, tubeless tires, telescopic front suspension, and LED tail lights. 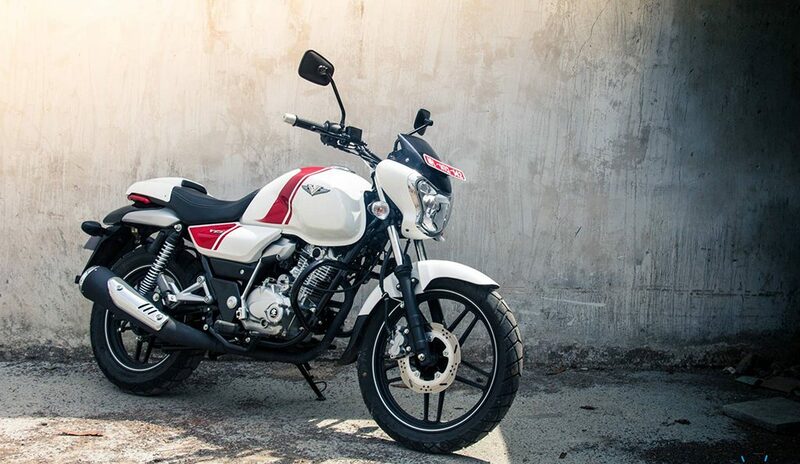 Bajaj V15 2018 is offered in 5 colors namely, Heroic Red, Ebony Black, Pearl White and Ocean Blue Colour. The pricing starts at Rs. 63, 680 (ex-showroom Delhi).